Football specific Pilates Courses are available – please contact charlotte@live-pilates.co.uk or call me on 07801 444825 to discuss your clubs needs. Many of the injuries sustained on the football pitch are unavoidable, resulting from the inherently physical nature of the sport, but many injuries which lay players off for several weeks are certainly avoidable if a player has an increased awareness of muscle in-balances and how to correct them through stretching,, mobilising and core stability work – the very things that Pilates do best! The end result is a body with poor trunk and pelvic stability and poor flexibility. 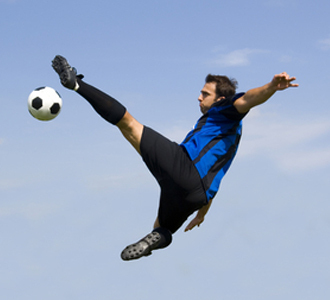 With the nature of football from a professional to an amateur almost every footballer favours one leg or one side so you will also have a unilateral balance. A dedicated Pilates programme can help to alleviate imbalances and keep you off the bench!